Here is just a small selection of the various interviews I have given. 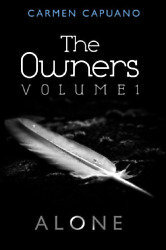 The Owners, Volume I: Alone and The Owners, Volume II: Storm Clouds, are the first two volumes of a series of ten. They have been likened by some readers to Avatar and the Lord of The Rings trilogy but are not truly like either. I think it is the fact that they draw the reader into a world that is at once unknown and yet strangely familiar, that brings about this comparison, helped along by the sometimes whimsical but always endearing characters and the overwhelmingly difficult situations they find themselves in. Volume I sets the scene for Loni, a fourteen year old Human pet and her Owner the Eyon, OwnLoni. They both live with OwnLoni’s baby Eyon, Little, who is Loni’s only true friend and confidante. Far, far away, lives the boy San, also a Human pet to an Eyon Owner. The story takes both of these Humans on a quest to find out the truth about their circumstances and forces them to confront fears and insecurities they did not even know they possessed. Volume II is in effect a prequel and shows how the situation of Volume I came into being. How a combination of destiny, nature and circumstance combine to devastating effect. The Owners books are beautifully simple tales of the necessity of human identity, woven intricately into a struggle between what is right and what is more right; between one kind of love and another. They centre on the concept of what it means to be human, with all the emotional and physical frailties this entails and subtly examine how humanity can so easily be lost and at what cost to the soul. And yet there is a lightness to the books – a sense of hope, which shines through the darkness and the despair, to illuminate the enduring spirit and unfettered heart that exists somewhere within us all. Why ten books? Why not nine – or eleven? The story started off as a single, stand-alone novel but by a third of the way through, I realised that it required a follow-on book. The characters demanded some resolution to their problems and I was too drawn in to leave them. Because of the way the story comes to me [in its own time and at its own pace] I was as caught up in it as if I were reading it, rather than actually writing it. I needed to know what happened to the characters in the end and how their situation arose in the first place. So by the half-way point of Volume I, the story had developed into a trilogy and by the end it was a full series! Volume I creates a different world to the one in which we live and Volume II shows the very first steps on the path to that new world. Volume II is in effect a prequel. Anyone and everyone who enjoys a good read. There is something in these books for everyone. Like the layers of an onion, the book can be dissected to reveal a multitude of strata – veins of philosophical thought, threads of moral and theoretical conundrums – or simply sliced and diced for the pure simple enjoyment and entertainment of a good story, well told. It is all there for the taking. Tell us a bit more about the world your series is set in? In Volume I, there is a sun and a moon, night and day, light and dark…it is similar to the world we live in today. But the landscape is different. There are huge marshy areas and many lakes and rivers, which makes the land lush and green and different to our conurbations of cities. There are people in abundance but not living independently or in family groups. These people are kept as pets by the Eyons, large feathered-bodied creatures which have human faces but which speak their own screechy language. The human pets are loved and cared for by their Owners but they have no freedom of will, no choice over their own destiny. San and Loni are human pets too but they are different to the norm. Not content to accept things as they are, they strive to find the answers for the questions no-one else will ask. They want to know why things are as they are. Volume II is set just a little into our future and shows the world very similar as it is today …before natural storms devastate the Earth and begin its journey to the world of Volume I. If this series is not similar to Avatar or Lord of The Rings, what is it similar to? It has a familiar and yet unfamiliar world, humans who are the same and yet not the same as us and non-humans who are not so dissimilar to ourselves as to be totally alien. There are no space ships or laser fights, nor is there teleportation or any overtly strong science fiction elements, that would make it unpalatable for those who do not enjoy science fiction. And yet the series is science fiction. The books have a unique appeal – non-SF readers will enjoy them for the characters and the situations they find themselves in, whilst SF readers will enjoy them for the lavish world that is created within their heads, filled with non-human creatures and pet humans. I do not think the books are really similar to any other books but I do think that they can be enjoyed across the board, regardless of the genre readers usually prefer. And that is something that is very rare indeed. To physically get the words down on paper and then published as they are today? A few years. And yet that is not the whole truth. The truth is that they took a lifetime to write. It took every experience in my life from birth to the present day, the ups and the downs, good and bad and the successes and failures…it took all of these and more to write these books. Every feeling of love I have ever had the luxury to cherish, every heart-rending event in my life, every time I have been forced by life and circumstance to try to see the funny side of something near catastrophic…all these have been channelled into my books. To my mind, I could not have written these books had I not lived this life. Wow, what was the most challenging part of the process? Finding the space and the time to be able to write without interruption. I live in Bromsgrove now but am originally from Scotland. I lived in Glasgow until I was eighteen then moved to England. I have done some work in musical theatre and have a degree in education but have worked in such diverse environments as chip shops, bingo halls and veterinary surgeries, so have had a rather hodge-podge, checkered career. Have you got a blog where readers can keep up with your work? Yes, my blog is carmencapuano.blogspot.com and you can also find me on facebook and on twitter (@CarmenCapuano). My website, carmencapuano.co.uk, is still under construction but I hope it will be up and running soon as I have lots to say! The books can be bought from Amazon ( US, UK), Waterstones or WHSmith or alternatively you can contact me direct if you want a signed, personalised copy [also a little cheaper than through the outlets above]. The Owners, Volume III: Dark Side Of The Sun is due out soon and work has already started on Volume IV, so I’m keeping busy! I have published four books from The Owners series and have a further two ready to go and four more still to write. 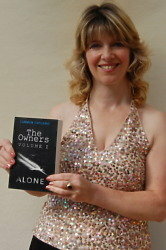 I became a full time author two years ago upon release of The Owners Volume I: Alone and have not looked back since! I try to write at least three days a week during school terms when the house is quiet and empty. My latest book [not yet published] is entitled Split Decisions and it came about by me thinking of a ‘what if’ scenario. It was a very complex book to write but I enjoyed it immensely! Split Decisions is a contemporary book, set very much in the world we live in today and this is reflected both in its characters and plotlines. It has a completely different target audience to The Owners and it was nice for a change not to be world-building as sci-fi so often requires. Like all my books, Split Decision will appeal to adults and teens alike so hold on to your hats readers! I like to write sitting on my bed. It’s not a creative thing as I can write anywhere…I’m just more comfortable there. But like most authors I always have a coffee to hand and am constantly refilling the mug! I am quite an eclectic reader and always have been. As a child I enjoyed Enid Blyton and Charles Dickens before moving on to George Orwell and the like. One of the books which made the biggest impression on me was Brave New World by Aldous Huxley – the concepts seemed huge! Nowadays I tend to read Dean Koontz because I find him kind to his characters and I think that’s important when you are reading a book. I am currently working on another novel called The Boy Who Rescues Pigeons [working title so may change]. It’s a complex tale but there are moments of real mirth in there too, as is often the case in real life. I know we all strive to make our characters more than two-dimensional but this is actually rather hard to achieve. In The Boy Who Rescues Pigeons I hope the reader will be able to see beneath the characters’ exteriors to the motivations, beliefs and compulsions which drive their every action. I don’t honestly think I have discovered that yet! To be honest I think the books pretty much sell themselves and figures show that the readers who buy volume I come back for the other volumes, so I must be doing something right. Be very sure your nerves and self-esteem can take the criticism that will be levelled at you – writing is one of the toughest businesses to get into. As long as you are doing what makes you happy then you are the most successful person in the world! It is not all about financial gain…although the rent still has to be paid obviously. I have got a new book [Stephen King] which I am saving for my days lazing by the pool in Lanzarote! Books, books and even more books! Lightening by Dean Koontz; The Stand by Stephen King; Brave New World by Aldous Huxley and Watership Down by Richard Adams which was another book which influenced me immensely when I read it as a child. The Koontz book would represent hope for me whilst the others would perhaps remind me that being stranded on a desert island would not be the worst thing that could happen to me! The Owners, Volume IV : A New Epoch takes up the story where it was left at the end of Volume III. We follow the same characters as they try to establish a new life for themselves after the devastation of the Superstorms. New characters also come into play however and there is a merging of old and new which brings out different elements of the storyline. Volume III allowed me to expand a little into the history and motivations of the characters and this is ramped up in this fourth volume. This is the fourth volume in the series, so what can you tell us about the previous books? Volume I is set in the far distant future where humans are kept as pets by another species called Eyons. Their lives are very different to our own and yet there are similarities which bridge the gulf…humans live with their owner Eyons in houses but they are tree-houses and the humans socialise with other humans only when their Eyons allow them to do so. Volume II starts in the almost-present time and shows how this situation began. Through Volume II and subsequent volumes, the reader is taken on a journey of tiny baby steps to show how this situation came about. Discover information, support and advice from experts and other parents of children aged 0 to 3, on the subjects of feeding, sleeping, development and activities. Fairy caught up with some real mums from across the UK and asked them to share their very own 'Mum's Tips & Tales' - watch our videos on what they had to say. We'll be catching up with more mums in the coming weeks, so check back for more. Why is sci-fi perceived as a man’s genre? I think women hear ‘sci-fi’ and think of ‘Star Wars’ and ‘Star Trek’ and whilst there are many, many female sci-fi fans out there, I think it appeals more to men. Traditionally too, I believe sci-fi was seen as being more about the story and less about the characters…something that I am working hard to change. For me, the story has to be not just about the situation the characters find themselves in but also their motivation, their back story, the things that make them tick. I could write a book about each and every one of my characters in isolation to the story or stories in which they appear. As a female fan of sci-fi I don’t want laser fights at dawn, I want to know how the characters feel and what has driven them to this point. How have you managed to capture such a wide reading audience in the books? It’s about the fact that my stories are a good read and the characters are heartfelt. The themes explored appeal to any observer of humanity and the story is easy to read without insulting the readers’ intelligence. I think it’s a fine line to draw…being interesting without being over-complicated. In what ways can your books be compared to The Truman Show and Utopia? I have not seen Utopia but with the Truman Show what I remember most captivated my attention was the humanity within in…that showing one man’s life and all its glories and conversely its frailties was both appealing and repellent. I loved to watch the character in his various situations as they unfolded but when I saw it as the sham it was my heart bled for the injustice of his life. With my own books, it is the humanity of the characters which shines forth, their frailties and flaws, their valour and their depth of conviction and it is this which makes the book stand out from the crowd. These books are your debut, so was novel writing anything like you imagined? No! It is at once like having your teeth pulled without anaesthetic and receiving the biggest accolade the world has to offer. To see the words you have written mean something to someone else …the excitement is immeasurable. When I give a talk about my books I am so excited I am like an overflowing cup! You were born in Glasgow, so what brought you to England at the age of 18? I wanted to be on the stage so I went to London at eighteen. I did do some theatre work but not enough to call it a proper job. You were interested in writing from early age, so can you tell us about some of your earliest attempts? I remember being about eight and deciding to write a continuation of a play I had been reading. It was about a black family in the 1920’s and I remember my teacher reading it and being so impressed that I was pulled out of other lessons and asked to continue with my play. That was in the days before the National Curriculum. Teachers would not be able to do that now. So if I’m not good at fractions that probably explains it! Why was it when you had your own children that your enthusiasm for writing grew? I had more time on my hands than I had had previously when the children were little and I read to them incessantly. It was then that I realised there are very few really good books for children around and took up writing. First I wrote some children’s books which I have not yet released then I began The Owners which is suitable for young adults. 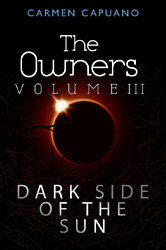 I am about to release Volumes IV, V and VI of The Owners. I am also working on a chick-lit book and a more serious book about a situation which blows a family apart. Friends are harassing me to do other female-centred books and there are a number of projects in the pipeline. I will keep you posted!